The Cormonachan Woodlands are 50 ha plus a 8.9 ha PAWS area of ancient Atlantic oak & hazel woodlands and have the status of being ‘Ancient Semi Natural Woodlands’ (ASNW) being preserved for Education, Conservation and Recreation. Much of the area had been under planted with Sitka Spruce by Forest Enterprise. Many of those areas were felled in the late nineties, but the trees were just left where felled. Rhododendron ponticum and bracken have invaded the area and increased in quantity especially in the northern felled section of the woodlands. This strain of Rhododendron takes over native habitats by creating a dense, dark canopy of stems that stops anything growing underneath and needs to be eradicated. Bluebells abound throughout the woodlands along with other woodland plants including; primroses, wild garlic, wood sorrel, lesser celandine, honeysuckle and ferns. Red Squirrels also live in the woodlands. The climate is ‘Oceanic’ with cool moist summers and warm wet winters. Rainfall is high at up to 2800 mm/pa. 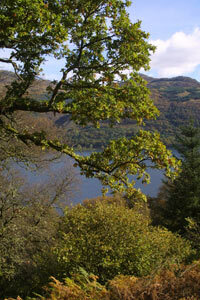 As the woodlands are positioned on the leeward side of the hills they are relatively sheltered though wetter. The primary soils in most oak woodlands in this area are Brown Earths or Upland Brown Earths of varying depths often very soft and moist. Wet areas either where the slope is less steep or in the presence of a wet flush generally results in a gleyed soil of some description. There are also many rocky outcrops, cliffs and exposed rock within the woodlands. The woodlands are at low altitude and relatively sheltered. Slopes are generally moderate at 20-30% but there are many steep areas associated with rock outcrops. The geology is primarily metamorphic, consisting of mica shists, undifferentiated schists, schistose grits and greywackes. Prior to the re-establishment of the lower path, there was evidence of an old pony or cart track with associated stone culverts. This may have been used as the old road to Carrick Castle. More recently the woodlands were used to shelter livestock, which has led to a lack of natural regeneration and a skewed age structure. Most recently prior to the commencement of the Cormonachan Woodlands project, Forestry Enterprise Scotland became owners of the woodlands and planted the gaps with exotic conifers that are now being cleared. 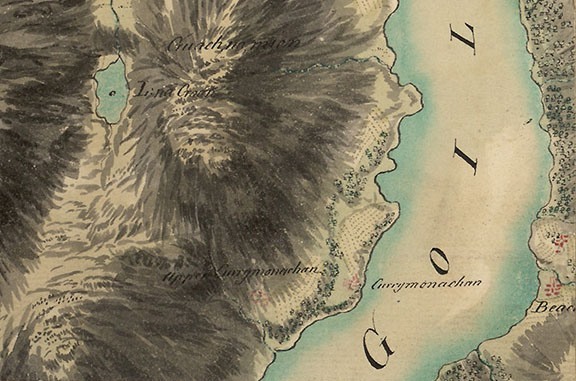 This is one of the earliest maps of Cormonachan Woodlands (Roy’s Map of 1747-1755) showing that the Atlantic oak woodlands date back to the earliest times maps were produced. Upper Cormonachan township is also shown in red alongside Cormonachan Burn and the waterfall with Lower Cormonachan township close to Loch Goil.